Previous Post Bust or Must? I like the check on it and it doesn't look too shrunken on you, it looks great combined with the bright jumper, I look awful in dark clothes too, I'm trying to phase them out of my wardrobe. Bourbon and Pearls, thanks!! I was a little worried about the length. 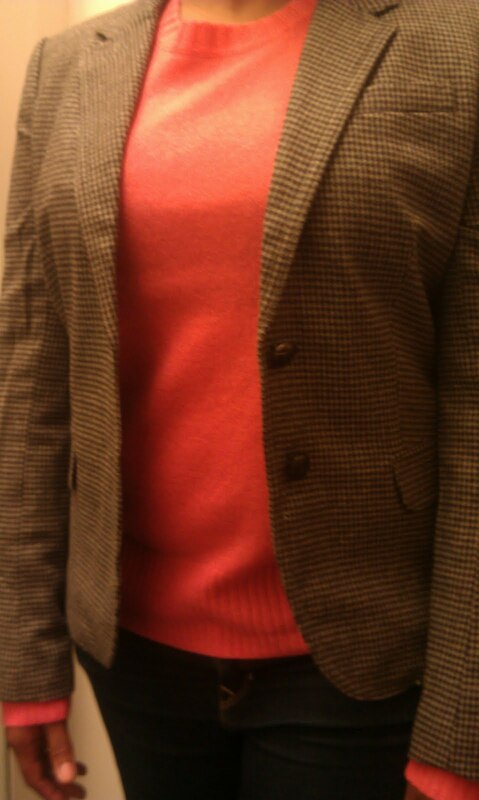 That's the Betsy sweater underneath, and I agree, the brighter color makes it pop. Thanks SO much for stopping by! I question the fit. The sweater is pulling in the bust area. The jacket also looks one size too small. Most people think the more snug something is, the better they look. On the contrary, it makes women look poured into their clothing. The blazer should button comfortably without puckering. Just my honest observation. Roevegas, I appreciate your honesty. Just so you know, I returned the Betsy sweater. I was concerned about the quality. And, this pic was a quick snap. The jacket fits really well. I absolutely refuse to wear clothing that does not fit properly, because as you point out, I don't want to look "poured" into it! Thanks for stopping by!